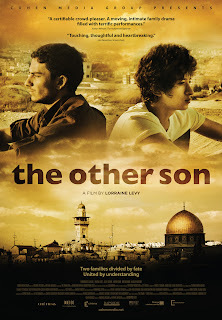 THE OTHER SON is a well made, solidly acted film based around the familiar melodramatic premise of the old “switched at birth” routine. In this case, the mix-up involves an Israeli family and a Palestinian family for additional dramatic oomph. The stage would seem to be set for a cheesy, even risible film. Thankfully Lorraine Levy's instincts as a director are to film the screenplay she co-wrote with Nathalie Saugeon in a more understated fashion than the plot alone might suggest, though not by much. The changelings here are Joseph (Jules Sitruk), who grew up with Jewish parents Orith (Emmanuelle Devos) and Alon (Pascal Elbe), and Yacine (Mehdi Dehbi), who was raised in Palestine by Leila (Areen Omari) and Said (Khalifa Natour). Everyone involved, including various siblings, is understandably shocked by the revelation, and each deals with it in their own way. In general, though, the female family members are far more accepting than the males. It all leads up to a “we're all brothers” conclusion that, while it may well have some truth to it, feels far too simplistic given the political realities of the middle east. 2 1/2 out of 4 stars.